Follow file and folder naming conventions. Create a .zip file of a folder. 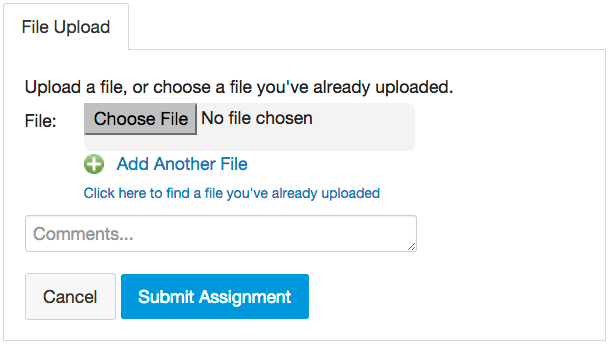 Complete an exercise by uploading the assignment's resulting file using Canvas. Mac users: open TextEdit - and be sure to make these preference settings. Enter the following in the blank file that opens, replacing "yourlastname" with your last name"
Be sure to have .html at the end of the file name. Permit the name if asked. Press Ctrl/⌘-O (that is the letter O as in Open, not a zero). To zip a folder, find the folder on your computer using Windows Explorer or the Mac Finder. The zip file ought to have the same name as the folder. Click on Choose File and select the zip file you created. Add any comments you may have about the assignment. Note that you can re-upload a file if you've made a mistake, unless I have already graded it.